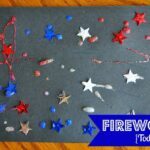 With July 4th fast approaching, I took some time yesterday to make some fun glitter fireworks with the kids. It is so simple and they turned out so cute! 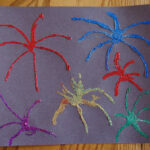 1. have your child use their glue to draw firework shapes on their black sheet of construction paper. I assisted my 4-year old on drawing one of them so he knew what I meant. 2. Sprinkle glitter on top of the glue. 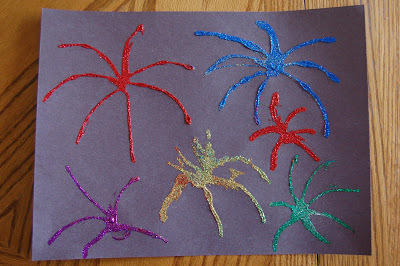 I had one of those glitter caddy’s that I purchased at Wal-Mart that came with 6 different bright colors, so we tried a different color for each firework. 3. 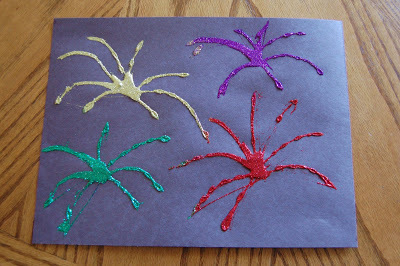 Turn the paper upside to remove the glitter and let it dry completely. 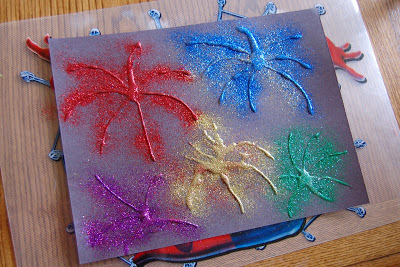 This works really good if you add the glitter with the paper inside a cardboard box, but we just carefully turned our paper onto our plastic placemats and then I pushed all the glitter towards the middle and poured it into a sandwich bag to use on a future project. Following from the hop. 🙂 Love your blog! I've got 5 kiddos so this is definately things I could use with them. 🙂 I've got a crafty blog, too. I have a link party on Wednesday's & a giveaway going right now, too. 🙂 Would love to have you stop by. What a great idea! The end result is so effective! LOVE! I am doing an America the Beautiful series right now on my blog. I hope you will hop over and check it out! 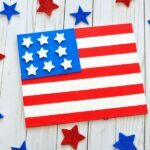 Great Fourth art! 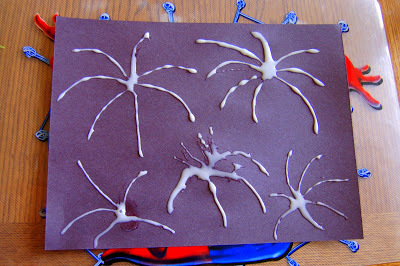 Thanks for linking up at It's Playtime! Thank you so much for linking up with me Thursday! You have no idea how much I appreciate it! I am going to have to give this project a try with my kids! I loved this idea so much, I featured it on my blog too! Thanks for your cute ideas! Grab a featured button if you feel so inclined! i love this information alot and the projects come out so cute.